A gigantic storm in the northern Atlantic created the swell, but a local High pressure system made for lekker weather and clea,n beautifully lined up 20-25 foot A-Frames that came grinding through. Nazare showed a rare part of her personality: consistent and clean and big. And Twiggy, who aged 45 was the oldest guy there, was on it from the get-go after spending six weeks with his young family surfing almost every day, "in one foot offshore to 20 foot onshore" as he explained to Peter Mel at the prizegiving. BWT Commissioner Mike Parsons was vindicated for his decision to call the green light despite thick fog early this morning that had initially masked the waves, followed by a period when it seemed the waves hadn't arrived yet. But arrive they did, and within the hour it was on. Within seconds of the siren sounding for the start of his Round 1 heat, Twiggy hooked a bomb, and didn't look back, saving his most strategic and fearless moment for the final. 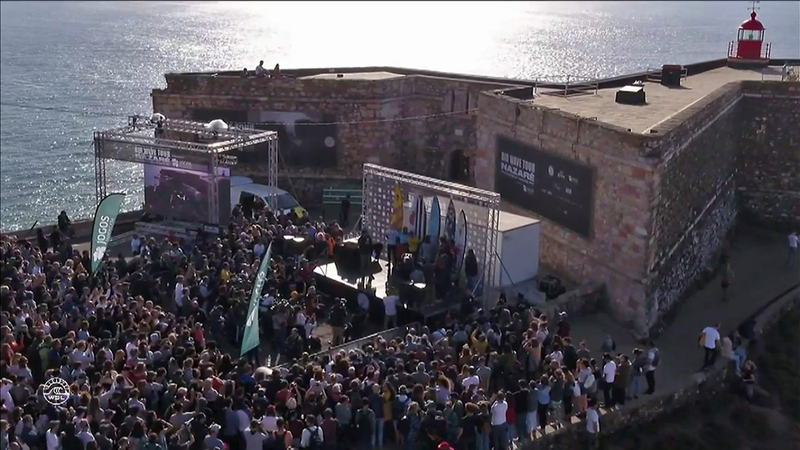 Apart from an aberration in the semi, when he narrowly survived a charge from Hawaiian Kai Lenny, Twiggy made it through, with last year's winner Brazilian Lucas Chianca (who took 2nd), the dangerous Basque surfer Natxo Gonzalez (3rd), local Portuguese threats Alex Botelho (4th) and João De Macedo (5th), with young 21-year-old Aussie Russell Bierke making his first final, and on his BWT debut nogal. Twiggy's "Crouching Tiger" stance was dominant throughout the final, catching eight waves. Not bad for a ballie. 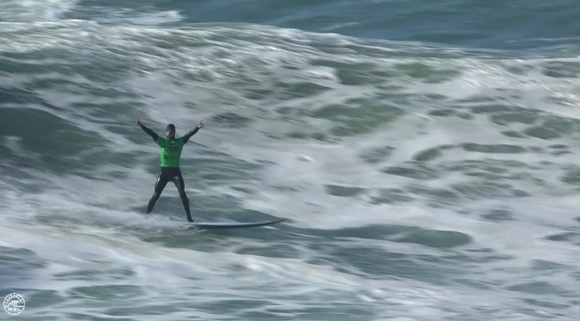 Baker caught the first wave, earning 5.33 almost immediately backed up with a 4.93. With these scores banked, he could afford to relax at the back to wait for the biggest waves while the others scratched for scores. He replaced the 4.93 with a 6.07, but was overtaken by Gonzalez, who in the semis posted the only 10-pointer for a ridiculous 30 foot tube in the semis. Chianca also got ahead in the middle of the heat. However, with 10 minutes to go, a massive set rumbled into view, turning the sky black. Some mortals would gag with terror and cry for their mommies. Not our Twig, he delayed until sure, then swung into the wave of the day and slithered vertically down a 40 foot face, skipping past tons of white-water chasing him. He claimed it big time. And why not. The judges gave him a 8.67, the highest score of the final. For extra measure, he added a 7.70 in the dying minutes to ward off any later charges. 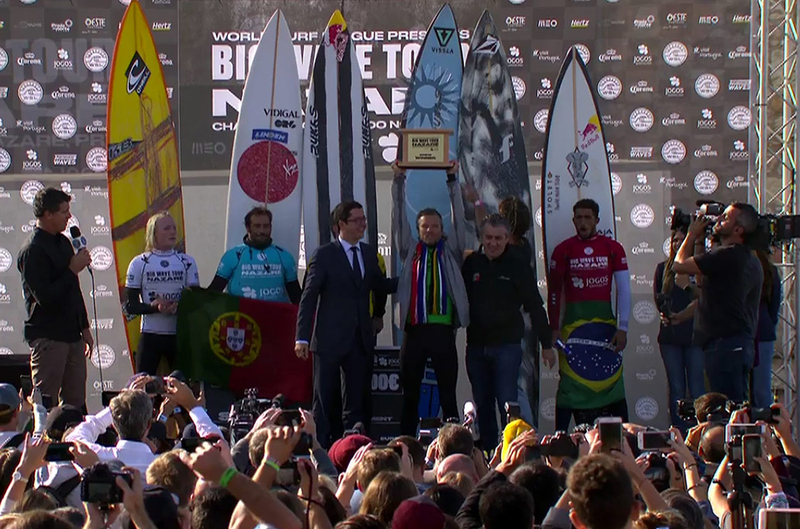 The 60-minute final was filled with increasingly risky rides as the surfers pulled out the stops going left and right on huge waves as the sands of time began to run out. Nazare was unusually consistent as well. The sets poured through pretty much the whole day, and the conditions remained clean. Both of these together is a rare animal in big wave surfing, which is often plagued by a lack of waves and frustrating flat spells. Luckily the 3.3m swell at 14 seconds, which did not look this big, but came through bigger and with more grunt than expected. Plus conditions were sublime as light winds caressed a silky, smooth sea. The Nazare Canyon - that 230km long, 5000 m trench leading up to the break - did its part to create the focus, convergence and ultimate amplification that morphs the water into those vertiginous A-Frames. 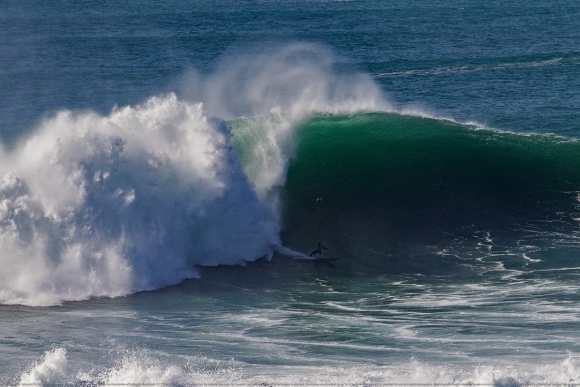 To think, Peniche was only six foot today, but Nazare thundered. It's a great start for Twiggy's campaign to bag a third world title, particularly because the Nazare Challenge was awarded "Silver Coeffecient Status". True to the US penchant to jargonise everything, this coeffecient ranking gives more points for bigger waves: Gold (40-50 foot faces and 12,000 points), Silver (35-40 foot faces and 11,000pts) and Bronze (30-35 foot faces and 10,000pts) or something to that effect. 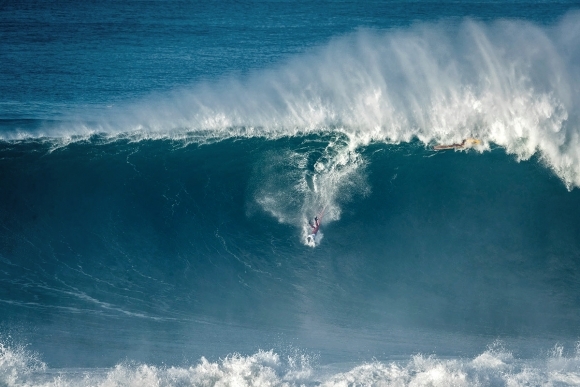 According to commentator Gigs Cilliers, and his metaphoric turn of phrase, Nazare, Mavericks and Jaws form the three points of Neptune's trident. Gigs did a great job in the commentary box, with some creative desciptions, particularly when talking wipeouts: "He was totally atomised!" Gigs, who just six days ago was surfing at Port Alfred in the first SA Kneeboarding Championships held in like 100 years, has become an erudite commentator with an quirky turn of phrase, delivered with quick wit and clarity. I would, however, remind him that "the annals of history" are not "the anals of history". But good job the Saffas!